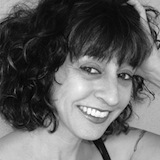 Kim Addonizio’s latest books are Ordinary Genius: A Guide for the Poet Within and Lucifer at the Starlite, both from W. W. Norton. Her verse novel, Jimmy & Rita, has just been reissued by Stephen F. Austin State University Press. Her collection Tell Me (2000) was a National Book Award finalist. She teaches poetry workshops in Oakland, California, and online. Burn me with a cigarette.